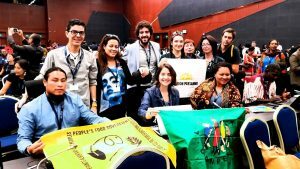 At CBD COP 14, La Via Campesina joined our allies MAELA as part of the International Planning Committee for food sovereignty (IPC) of which we are members. IPC is an autonomous and self-organised global platform of small-scale food producers and rural workers organizations and grassroots/community based social movements to advance the Food Sovereignty agenda at the global and regional level. IPC represents 6000 organizations and 300 million small-scale food producers. We were the only family farmers and small food producers group at this COP. At this COP, a key discussion was on CBDs Strategic Plan post-2020 – planning for CBD action plan until 2050. 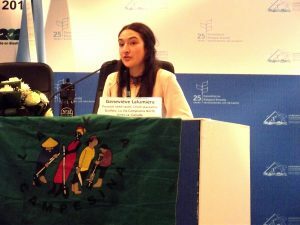 IPC hopes that this 2050 agenda will support the realization of the objectives of the Convention in a strict relation with indigenous and peasants social movements. Some of the key issues that we were following at this COP were gene drives, synthetic biology, and digital sequencing which were all being discussed by member states. All these technologies are being promoted under the guise of ‘public good’ by vested interests like the military and corporations such as the military research agency of the United States government (DARPA), the Bill and Melinda Gates Foundation, The Tata Trusts and the Facebook-backed Open Philanthropy Project. But, the ETC Group reports that their interests lie in agribusiness. For example, Gene drives aim to propagate genetic material, such as a gene that promotes sterility, across an entire population, potentially wiping out an entire species. A project called Target Malaria is pushing for this invasive technology, designed to eliminate malaria-carrying mosquito by spreading 10 000 genetically modified “sterile male” mosquitoes in Burkina Faso. The reality is we don’t know anything about these technologies and the CBD itself promotes the idea of ‘precautionary principle’- which means total precaution must be taken until there is clear scientific understanding of impacts. What if such characteristics spread to other species- animals, plants that humanity relies on for food? What will happen to farmers who rely on these species to grow food? The technology poses a serious threat to our health, land, biodiversity, rights, and food supply. Such Technologies that originate in the laboratory, such as GMOs and now gene drives, ignore deep seated injustices and power imbalances which require political answers and democratic scrutiny, rather than technical quick-fixes. At this COP, only Bolivia maintained a strong line in support for a full moratorium on gene drives, while Brazil, Canada and most African countries supported research bodies to self-regulate how they release genetically edited populations. African countries who were previously vocal seemed to fall in line with the Biotech industries position. We also organized a side event Friends of the Earth International, ETC Group, where many including members of African civil society spoke about the threats of gene drive technology to local communities, food sovereignty and biodiversity. The issue of Digital sequencing information is of major concern to us because of its potential support to bio-piracy. Rapid advances in sequencing and synthesizing DNA mean that ‘digital’ biopiracy is now possible. This raises questions about fair and equitable benefit sharing- what if genetic information of farmer varieties are taken by a corporation to create new life forms? This would mean biopiracy, and such processes must be strictly regulated. 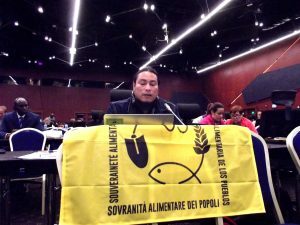 Our key demands with regard to digital sequencing were that Antonio Gonzalez from Guatemala and member of MAELA, made an intervention on our behalf at plenary discussions. the contracting parties ensure that the Nagoya protocol can regulate the use of digital sequencing information. the reference to “free access” to information cannot mean the absence of regulations on the use of this information. the contracting parties establish an open-ended group with the participation of indigenous peoples and local communities. this subject is also discussed with groups living in these genetic resources, now threatened by the “biopiracy”.